It was built for a 20" shaft and I want to get the new motors up higher out of the water with 25". You can see the kicker mount as it is now, but I want it on a fixed mount down with the main motor. crowsridge, first thing I notice and you should check is the new outboards' centerline offsets? Do they require 44" of transom width or what? My take from the pics (thanks they really help to see what's being discussed) this hull extension type (brackets in my terminology don't extend the planing bottom) engine mount may be too narrow? Of if it is wide enough ?? it sure won't hold twins and the kicker! So first is a plate riser/transom jack***/top spacer (*** not to be confused with hydraulic lift) and this could be made to bolt on if needed. 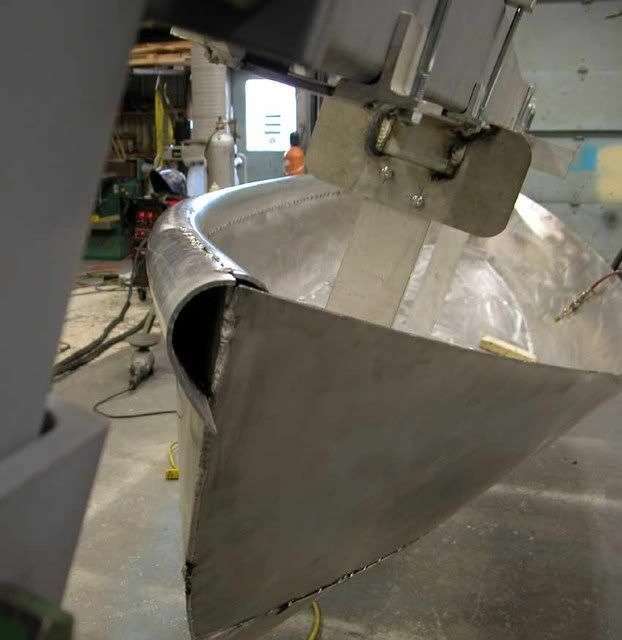 A piece of plate aft the existing transom, spaced to one that laps the forward 'lip' of the new hull extension mount's engine clamp can be made on the bench and not even welded to the existing mount? If you want to weld one on? Then; the same parts added together will hold a pair of engines elevated the four or five inches needed for the new engines. To meet your design goal of mounting the kicker down on the new hull extension? I'd say a wing off the existing addition is the best bet? Again, this could bolt or weld to the hull extension engine mount and hold the kicker where it's transom clamps are at cav plate above the displacement waterline. This is not measured to the running bottom or planing waterline like the two mains. If a kicker is too deep it will only give a fraction of its thrust, so the fixed kicker mount should be mounted where the cav plate in the down position is 1/2" below the at rest or displacement waterline. #1 Is the beam of the new hull extension adequate to hold both engines? #3 at rest waterline as basis for the kicker mount as a wing on the new mount. Hope we're getting closer to discussing what you'd like? What's inside the new hull extension mount? What are the two sides and are they reinforced in anyway except at to and bottom? What is the total wt of the two engines that will mount there eventually? Since my first post, Ive done a lot of thinking, and in one way I want to keep it simple. I'm going to leave the existing width alone and go single main motor and have the mount just to the left for the kicker. In your line of examples, I'm thinking the 5th from the right. Add extra support by extending the sides of the boat and having a platform all the way across the back. I'm really tempted to put a transom door in as well. This boat had the rod lockers built on top of the gunwales and then the railing on top of them.Makes a very high sided safe boat, but its not fun to get in/out of when you're an old, fat, short guy. The main motor is 615 pounds. Probably the Suzuki 300. I will go take the plate off and see whats inside the existing extension. Its made of 1/4". The bottom is also 1/4" and extends 8' forward to cover the old jet intake and make a smooth transition to the new back end. 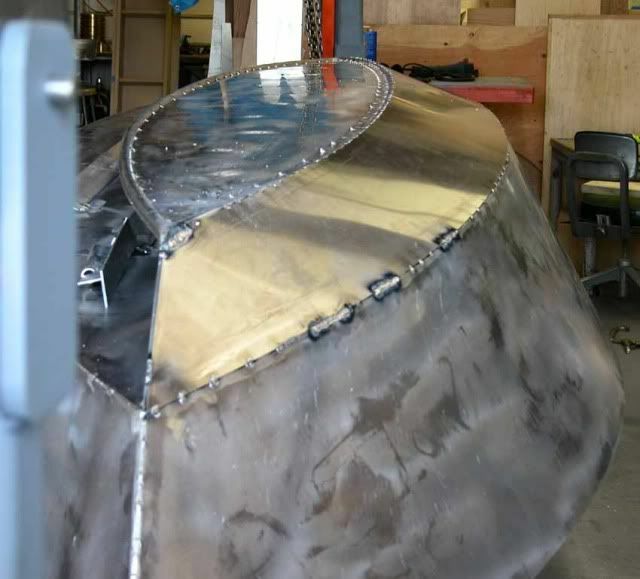 The extension is welded to the transom up both sides and across the top. I hadn't thought of the "at rest" part of the kicker prop height. I had been thinking the same as the main, but under way with just the 200 hp the extension was barely in the water. Trolling, the water level is 12-14" up the extension. Does the kicker need to be in front of the extension? ie, widen the extension? It seems most of the production boats have the kicker off to one side or the other of the platform. by adding the two 'side decks' to the hull extension you'd have built most of what is needed to hold the kicker mount, as near as I can see. What I was mentioning, not that the kicker should be on centerline but that lots and lots of kickers are mounted next to the mains. At rest the kicker's cav plate ends up 12" under the water!!! When an outboard can't get its RPM up in the power curve, regardless of gear reductions, most often the motor is not putting out 1/3 of its rated Hp. To get to the planned RPM, a prop has to be 'just under' the surface and if the mount is not planned for the at rest waterline or on a vertically adjustable mount like the one you show in the pictures (or some type of adjustable mount) then.... the kicker can't get to design RPM and therefore isn't in the power curve to deliver much power. If you do modify the stern to the design you mentioned then the entire after deck is helping to hold up the engine(s) and the kicker. But, if the entire hull extension you have shown is 1/4" ? I'd say that was plenty stiff to hold 600 -700 lb.s and if the jet plate was taken out and tied to the bottom extension; likely the interior structure was tied to the new mount as well? Sounds like you've got the structure to hold the new engine(s) to me. Not sure if there are remaining questions but I'd try to field them if there are? As always, thanks for the input. I hope to post pics of the whole build in a new thread soon. The pilot house is coming along very nicely in my view. thanks, glad you enjoyed the 'rant post' about stern design. Kens, truth be told I'm an inboard advocate myself. I live in an area where its common to put 2 X 300hp outboard on the stern of a 30-32' er and run 50mph burning 100-150.00$ an hour in fuel. I'd prefer to put in a smaller inboard burn less and go slower, having heat, hydraulics, and CG over CB for general performance.... but that's not the trend. I'd even spend the time to build tiny inboard installations, if I were building right now, just because I'd like to power some double ended dory-like shapes that won't tolerate the engine on the stern or overhanging the water. That's not the popular design though, so this article was intended to help outboard owners/builders/designers to see the entire "bush" they're going to be "beating around" as they think about future builds. I would like to see you post up some lines on the little dory you describe above. Very interesting. There is an old school boat in Florida, a Mullet Skiff. It is a rather flat bottomed skiff with a small weather house and a little, shallow draft inboard. I grew up around inboards. I can't shake it off. I'm not sure where the lines are? I took John Gardner's Dory Book and lifted the lines of the Chamberlain Gunning dory then made the lines into a three plank hull. There is a dory shoe, (flat bottom plank that is double ended) and a dory strake and a topsides. Now, I fiddled with the hull and made the bottom and ends into air chambers (rowing boats are exempt from 'foam- regulations') and this is what came out. In this photo above she's rigged with fixed seats of nylon truck straps wound on pipe frame thwarts screwed to the side rail angles inside the hull. The deck is 3" deep and runs the length inside of the bow and stern seats. She was an experiment in working in 0.100" thick metal to do welded boats. 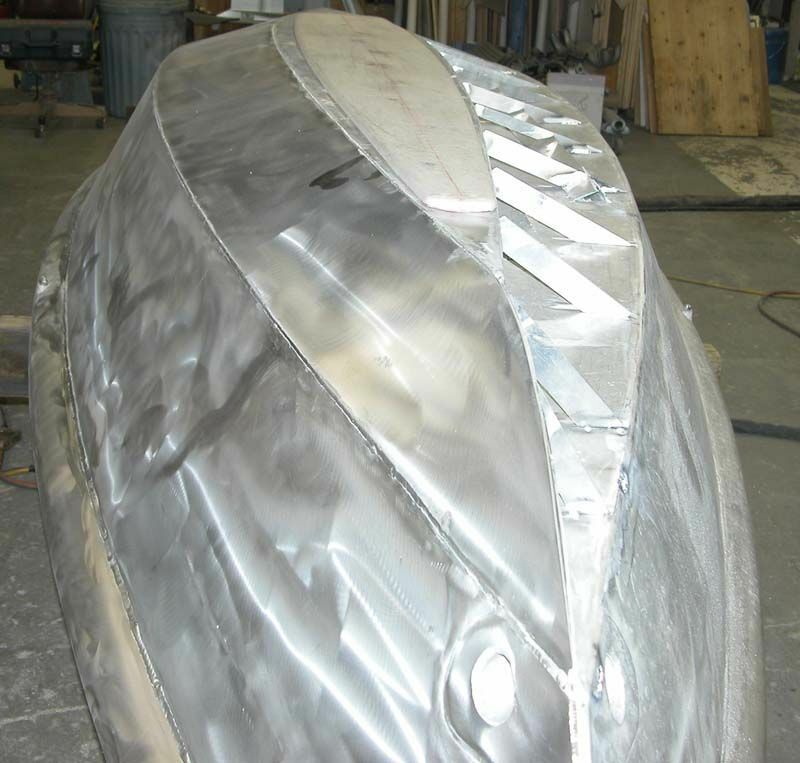 The photo above shows; a custom extrusion used at the gunwale allowed a nice flotation chamber if the dory swamped- and a nice smooth shape once welded and dressed off. Shown on a Davis Jig rotisserie fixture for the build. 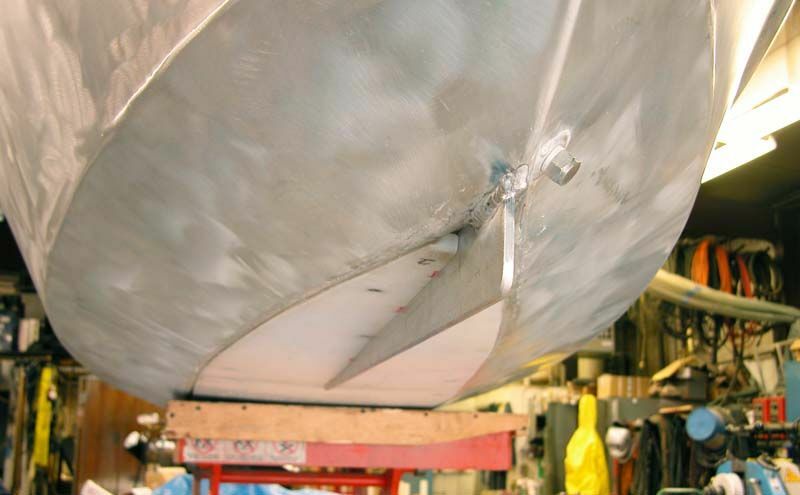 Above, a pic "under her skirts" of the stern and a skeg, the bottom's test port /drain port shop plug and the UHMW 'recessed skid plate' used in the original bottom design. Since changed a bit. She would drag by hand with one man pulling on her painter, so the drag plate does work well. Here is the rebuilt bottom, the recessed plate of plastic for dragging became surface mounted with rounded edges instead of recessed into a pipe 'chine' design that was not as effective as I'd hoped. The entire dory strake was replaced on both sides and the dory shoe was left, but trimmed in Plan View so the dory strake was refit; new. Photo of the original build with the dory shoe holding a pipe chine - the purpose of this design was to #1 round the bottom seam; #2 create a recess for the UHMW 1/2" drag plate- (aluminum does not drag well on rocks or sand) #3 to fair the dory shoe's edges while fitting the dory strake's lower edge as tangent to this pipe. The pipe was later removed, a new 2nd strake fit and the dory shoe (bottom plate) was then trimmed in making the bottom narrower by nearly 2" and increasing the angle of the 2nd (garboard) plank. Hollow bottom is shown as the deck is the surface 'below' (boat is upside down) the dory shoe. 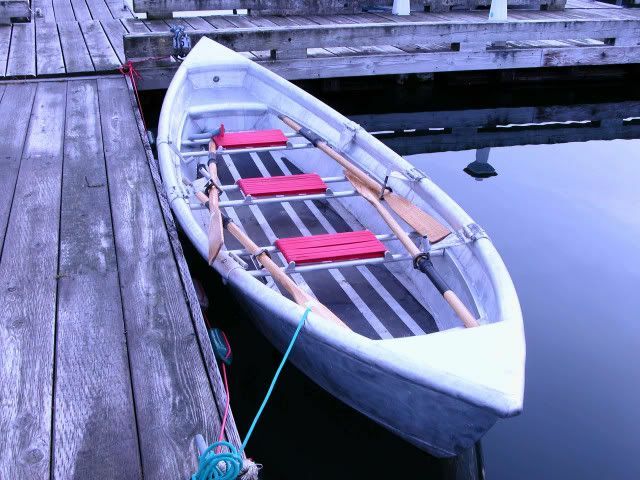 The dory moves pretty well with a variety of oars, and oarsmen. I was concerned with getting water in her while in the surf or caught out in weather but it turns out the boat is a cork. I'm sure you could roll her in surf if you got broach but I always managed to land her bow-to and each wave just lifted the stern and pushed us up the beach- rock or sand. She weighs about 175lb. on her trailer and I've had five adults in her (1,000 lb.) to row from the center position- so the boat, as designed by Chamberlain, was a good shape that did what he intended- haul loads in the salt- though a surf. This is the type of hull, very small 17'-6" here, that I'd put a little 'putt-putt' into and a shaft our the stern where the skeg was/is and just putt around the shores of the Alaskan coastline. Any gas engine would have to be located pretty much under the center rowing position as shown above. I've also toyed with the idea of adding a DC trolling motor set up so the ride was super quiet and the ride would be about the same hull speed of 4-6 knots depending if you're cruising or racing? https://images.duckduckgo.com/iu/?u=htt ... gL.jpg&f=1 I'm not sure if the design for the Gunning Dory are in this book or the next? http://www.amazon.com/Building-Classic- ... 007142797X one of these two books is where this dory's original lines are shown. Anyway, this is what was behind the remarks you noted.